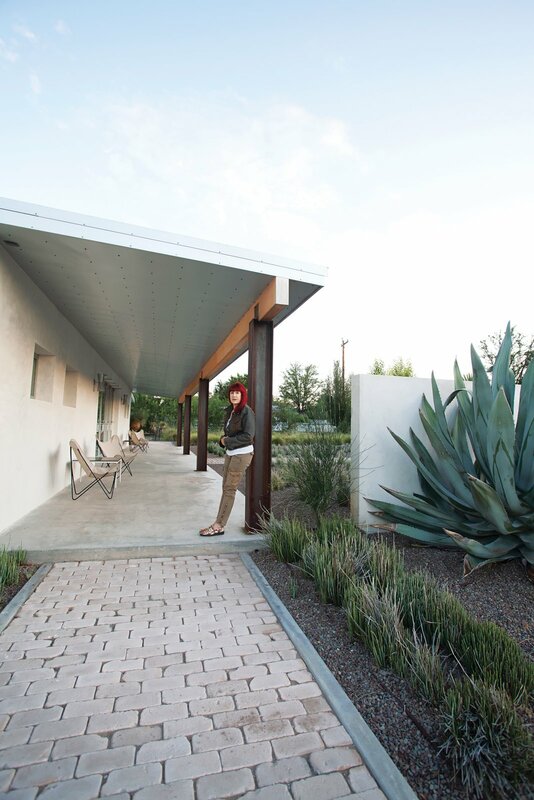 Designer Barbara Hill, in front of her recently renovated weekend house in Marfa, Texas. A series of Galvalume roofing panels clad the underside of the eaves. The first step was cleaning the place out. I filled eight huge dumpsters and many more flatbed trailers with trash and construction scrap. In doing so I realized that everything that contributed to the cramped feeling, from the ten-foot ceiling to a bunch of awful temporary walls, could be taken out. I became obsessed with taking the building to what it once was?-essentially one large room. Plus, I hate walls and an open living space is the next best thing to being outside. The seating area includes an extra-long sofa by Piero Lissoni, and a leather armchair designed by Alfredo H?berli for Moroso. The Twiggy lamp is from West Elm. I tried to save the floorboards, but the planks were rotten due to leaky plumbing, a roof that was in bad shape, and years of standing water. We dug them all out and in the process found several pits under the house?which suggested that the building’s adobe was sourced from the site itself. This delighted me. 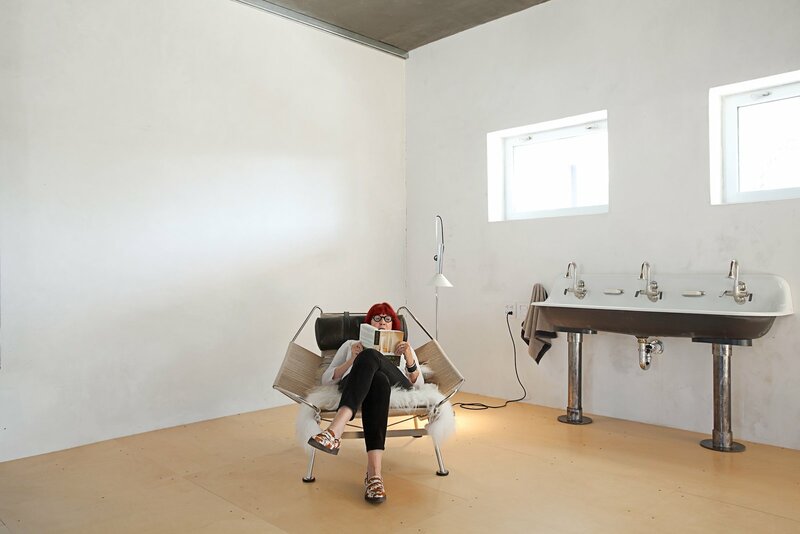 There’s something comforting about being inside a house made of mud. In addition to the natural insulation from weather and noise, there’s always a slight scent of the earth in the air. I find it calming.
? ?In the bedroom, an improbably placed tub is situated in front of two closets that can easily be maneuvered thanks to skateboard wheels affixed to the underside. Removing the hideous walls wasn’t a problem, but stabilizing the interior to allow for a high ceiling was certainly a challenge. And high is never high enough for me. It was immediately obvious that I would need to call upon a structural engineer, so I found Dan Ray, who knows how to work with adobe. Dan suggested immense steel beams to shore up the tension. While adobe can withstand enormous pressure from top to bottom, it will buckle if the pressure comes in from the sides. Since I went with birch plywood for the flooring?I felt it referenced the building’s past?I thought I’d cover the pitched part of the ceiling with it as well. 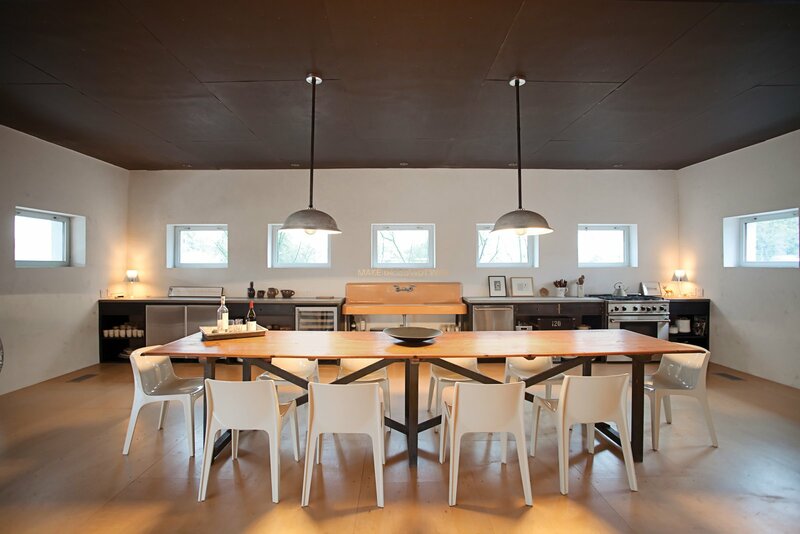 I like the look and the continuity; it unifies the space and complements the blackened steel. Lacquered chairs from Holland cut a low profile next to the dining table, a French antique found at Installations Antiques in Houston. “I don’t like anything to match too much,” says Hill. It turned out to be cost-prohibitive to create high ceilings throughout, so I ended up with one big, soaring central space flanked by two areas with lower ten-foot ceilings. In the end, it was a good thing, because the difference in height helps to define clear eating and sleeping zones. I placed the kitchen along the length of the street-facing wall. I don’t cook a lot in Marfa?in fact, I use the dishwasher as a drying rack most of the time?so I kept it simple. 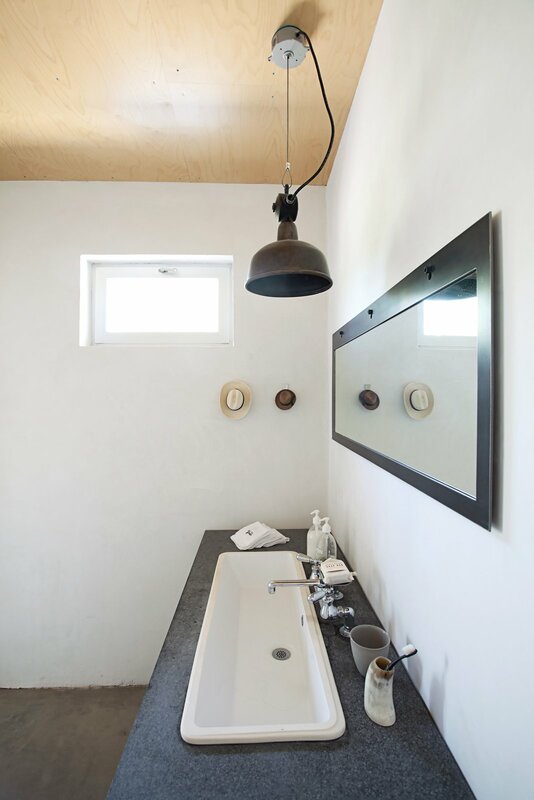 I found a great old putty-colored sink at a demolition yard and saved my splurge for a 13-foot-long French table with a base that looks like steel to match the beams overhead. A voracious reader, Hill kicks back in a Hans Wegner chair topped with a shaggy throw made from the wool of a longhair sheep. 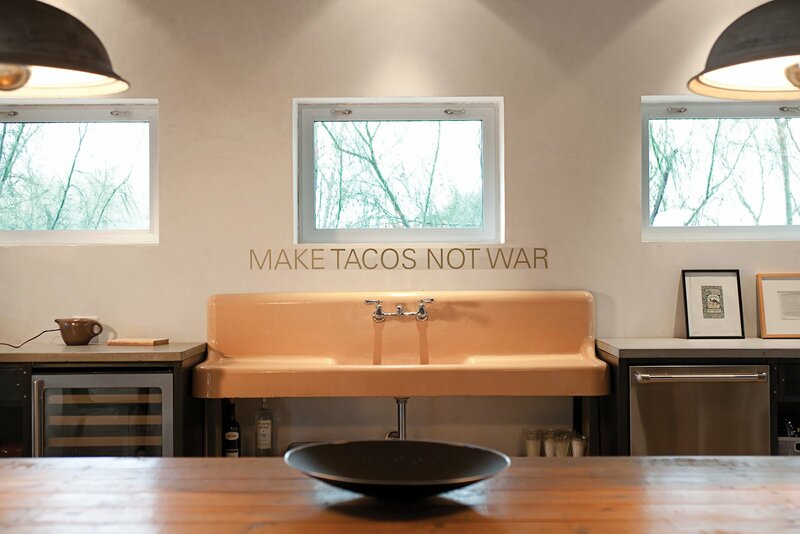 In the kitchen, Make Tacos Not War, by San Antonio-based artist Alejandro Diaz, is mounted over a putty-colored sink Hill Salvaged from a demolition yard. Now, I realize that having a bedroom and bathtub in the middle of an open space isn’t for everyone, but the romance of it appeals to me. I get so much joy waking up, because the first thing I see from my bed is this trough-shaped bathtub that reminds me of a cowboy boot. For times when I need a little privacy, I deigned two closets atop skateboard wheels so I can move them as I please and create a partition from the seating area. 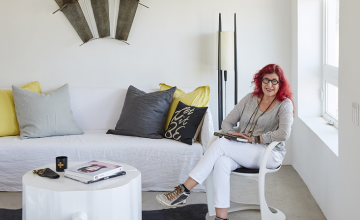 Hill worked with metal artist and designer George Sacaris to create a sculptural gas fire pit in her backyard. Using repurposed pipes uncovered during the renovation, Sacaris welded them together in a vertical formation. When the fire is flickering, it engulfs the sculpture and adds another note of drama to the outdoor area. 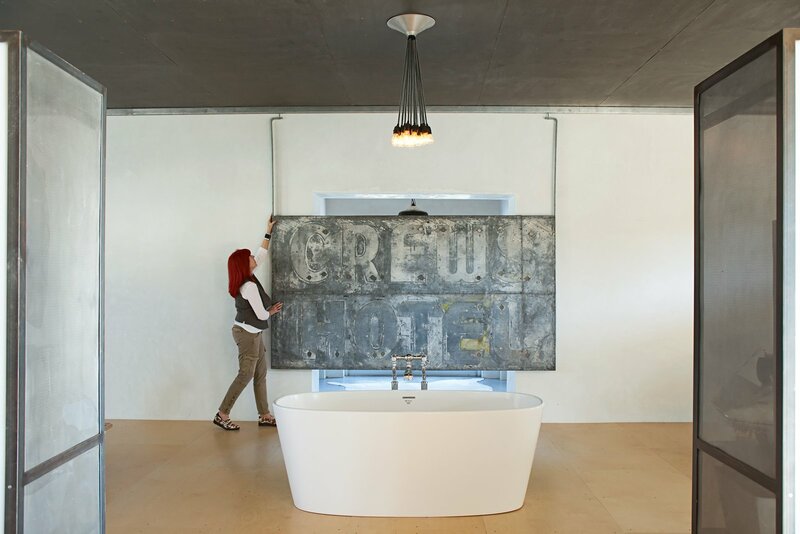 Another element I love is the old sign, salvaged from Marfa’s Crews Hotel, now part of the Judd Foundation. I found it in a shop in Houston; actually, I guarantee the guy pulled it out of a trash pile and marked it up something awful?but I had to have it. The sign isn’t just for looks; it’s mounted on a sliding steel armature, so I can position it over the doorway and block the view from the backyard. Balancing openness with options for concealment is aways smart. 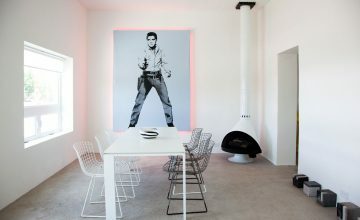 Seeking a large-scale artwork that could also act as a privacy screen for her bedroom, Hill hung the vintage hotel sign she scored at Installations Antiques in Houston on a sliding track. When she wants to block the view from the backyard, she simply slides the sign along its blackened-steel track into place in front of her doorway. 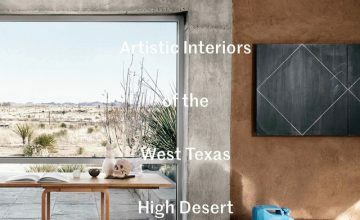 The outdoor area was very important to me?the light in Marfa is soft and wonderful, and I knew I’d be spending a lot of time outside. 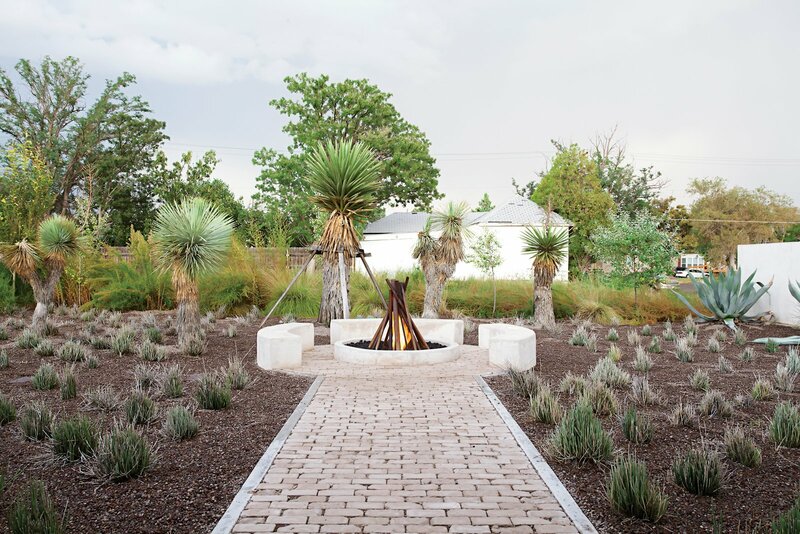 I had the idea of a courtyard space build around a central fire pit, so I asked George Sacaris, a designer, to create a sculpture in the shape of a campfire using some pipes unearthed during the renovation. Weeds had overtaken the entire site, so I tore up everything and replaced it with native plantings like sage, yucca, and great white cactus. I paved the walkway with old bricks from El Paso and found some great rusty steel plates from the railroad to use for additional footing in the yard. People are always poking their heads in, complimenting me on the colors and the symmetry, which is nice. This is a real community, where neighbors and looky-loos are always welcome to peek over the fence. It’s part of the reason why I love it so much here. Hill’s custom closets do double duty as both clothing receptacles and movable partitions, thanks to skateboard wheels affixed to their bases. Substantial enough to create a visual barrier but translucent to allow light through. the closets are backed by panels of formerly glossy white Plexiglas that Hill asked Sacaris to rough up with a piece of sandpaper.